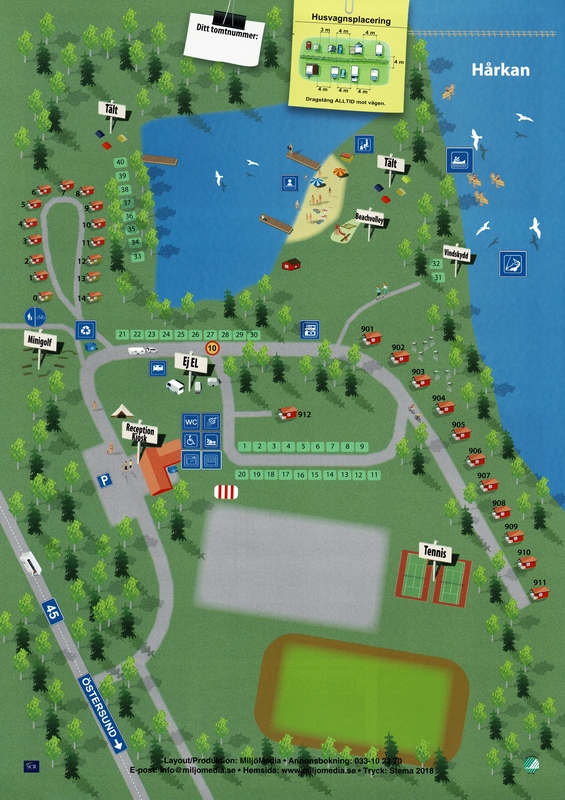 In addition to canoe rental there is a lot to do here at Lits Camping. Visitors are welcome to park for free on the gravel side opposite reception. If you do not live at the campsite, please do not drive into the area. Mopeds are banned on the entire camping area. Parking for mopeds is under the bridge towards Lit. If you drive a car, remember that there are many children moving around on the campsite. At the campsite we have rabbits, sheep and lamb. These are good to pat and feed. However, it is forbidden to enter the paddock and / or try to open the locks on the rabbit cage. Take care of the animals and do not scare them. Is open to the public. There are two longer docks in the bathing lake (pond) and a floating bridge in the water. Playground and swings for the children next to the beach. You can also swim directly in Hårkan, which flows past the other bathing lake. Next to the beach you will find table, wind protection and barbecue facilities. There is also a beach volleyball court. Free to use the court. Volley-ball can be borrowed at the reception (camping guests). For non-residents we charge a fee of 10 SEK. Available to borrow for our campers. This is mainly about children’s bikes. Available to borrow / change in the bookshelf in the public kitchen in the service building. We rent out canoes and kayaks. Read more on our Canoe page. We sell fishing licenses for Lits FVO. At the reception we sell simpler fishing equipment as well as worms. For tips and questions contact the reception. Free to use (though conducted football training which has reserved the plan, they have priority). Balls can be borrowed at the reception (camping guests). Our large cabins all have a private barbecue ring, but there are also barbecue rings at the smaller cabins and down at the beach. Many of our guests bring dogs or simply enjoy a walk in the woods. Hogfors trail starts at the camp and extends about 8 km upstream along the Hårkan. Along this you will find an exciting nature and amazing views. Read more on the website of the High Representative. For a shorter trip, there is a trail of 1km going around the headland where the campsite is located. We offer free wifi in the entire area. The sauna is completely renovated and is conveniently located down the water. Accommodates up to 10 people. Is free for accommodation at the campsite. Playing softball on the football field next to the service building. The price includes bats and balls. The plan is free to use. Rack: 25 SEK / piece (balls included). Our giant tent is free to use for the campsite guests. Here you will find barbecue area with table for more than 30 people. If you want to rent it exclusively for your company for one or more nights, please contact the reception for price quotes. There are also possibilities for power to ev. Sound system, projector etc. This is a trampoline designed for children up to 13 years. Max 1 child on the mat at the same time. All jumping is at your own risk. The trampoline is intended for residents of the campsite.